The biggest threat in business is ignorance. So many people buy businesses, not completely aware of the responsibilities and demands they’ll be undertaking. They make mistakes that cost them time, money, and peace of mind, and hurt their businesses. 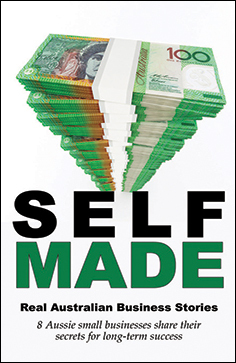 Self-Made: Real Australian Business Stories contains eight biopics from business owners who’ve been there and done that – they’ve made their mistakes, picked themselves up, learned the hard way, and are now successes in their fields. If you’re looking to get into business, or own a business and need hints and tips about how to streamline operations, kickstart productivity, or just find a way to do things better, you can’t go past Self-Made: Real Australian Business Stories. Don’t delay! Join the ranks of those who are self-made!